Gov. Ned Lamont (right) and Administrative Services Commissioner Josh Geballe announce plans to reduce forms businesses must file to sell to state government. East Windsor — Gov. Ned Lamont unveiled a series of proposals Tuesday to reduce bureaucracy and make it easier for businesses to work with the state. Lamont, who made the announcement at Infoshred, a local document shredding firm that holds the contract to dispose of sensitive state documents, said his initiative would eliminate thousands of unnecessary forms the state must process annually. 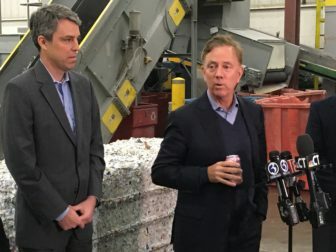 “With fresh eyes, an aggressive approach, and collaboration, we can modernize state government the way it should be,” said Lamont, who made the announcement standing before two huge rectangular blocks of shredded paper. “It is too difficult to navigate through our agencies – it slows down our employees and our businesses. Department of Administrative Services Commissioner Josh Geballe, who joined Lamont at the announcement, said the administration also was launching an electronic outreach program to solicit new ideas to reduce bureaucracy. Anyone with a suggestion may post their idea — using the hashtag cutredtapeCT — on Twitter, Facebook or other social media. The state also has created a new email address — cutredtapect@ct.gov — that also will be monitored. The department will review ideas through the end of April, but those who submit the best ideas over the next week will be invited to discuss their ideas directly with Lamont and key commissioners. Lamont said every state that wishes to sell a product or service to state government must fill out at least seven procurement forms. The administration has crafted a bill under consideration by the legislature that would reduce this to one form. The goal, the governor said, is to eliminate more than 90,000 forms that must be filed with the state each year. Developing a state certification process for small businesses that mirrors the federal process. Providing businesses more options so they can transact with state government online. Modernizing the state’s data processing system so more companies can bid online for contracts. The administration says this would expand the state’s purchasing pool and reduce costs through increased competition. Targeting and eliminating duplicative functions performed by multiple state agencies.